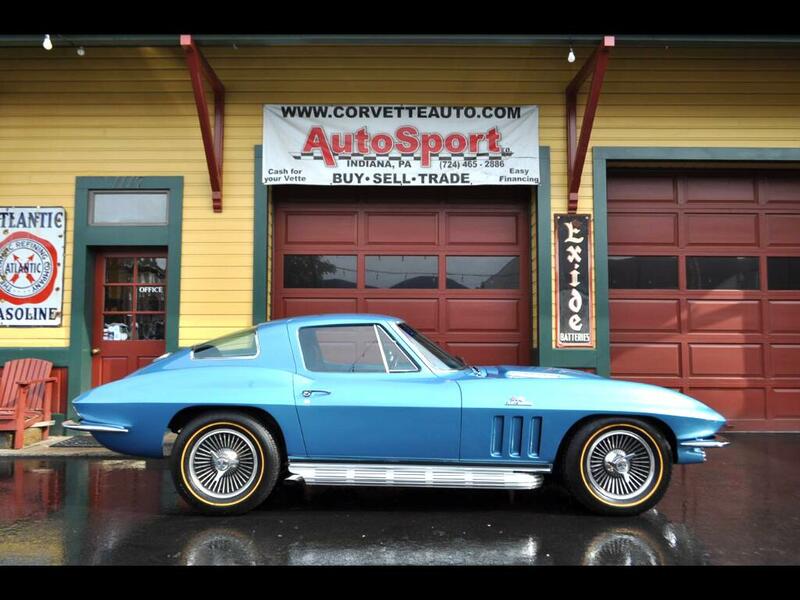 Used 1966 Chevrolet Corvette Sold in Indiana PA 15701 AutoSport Co. Trim: 427ci 390hp Factory AC 4sp Loaded! 1966 Nassau Blue 427ci 390hp Nassau Blue/Blue Corvette Coupe!! This rare big block Corvette coupe is loaded with some rare options! Factory AC, Power Windows, Power Steering, Head Rest Seats, Leather Interior, Side Exhaust, Aluminum Knock Off Wheels w/ Gold Line Tires, and Factory Transistor Ignition! Close to $10,000 invested in the suspension at Yogi Bair's! More details to come! Please feel free to call us at 814-977-9219 for some more details! Vehicle Inquiry for 1966 Chevrolet Corvette 427ci 390hp Factory AC 4sp Loaded!